Steroid treatment for osteoarthritis knee suffers was thought to progress the disease, but that belief has been overturned following a review of the literature by researchers at The University of Auckland. Associate-Professor Bruce Arroll, from the School of Population Health at the University, says that osteoarthritic knee pain is one of the leading causes of disability amongst older people. "Previously it was thought that you could give sufferers about 20 mgs of the steroid cortisone (prednisone) for a couple of weeks, but that it promotes disease progression if it is used any longer." "From reviewing all the hospital-based research, we have found that there was no evidence that cortisone progresses the disease. In fact, it provides an effective pain relief for up to five months particularly if the dose is increased to between 40 and 120mgs," Dr Arroll says. There is no cure, other than surgical joint replacement, for knee osteoarthritis, but Dr Arroll says the study gives hope of pain relief for sufferers. "Our finding that giving steroids is effective for longer periods means that knee replacements won’t be needed so urgently. The injections will enable people to walk, be more comfortable and have less trouble from their knees," he says. The study, commissioned by the Accident Rehabilitation and Compensation Insurance Corporation, was co-authored by Dr Arroll and Dr Felicity Goodyear-Smith from The University of Auckland and was published this month in the British Medical Journal. Dr Arroll says surgeons and doctors are already showing an interest in the work. "Another concern that was raised in the past by surgeons is that treatment could weaken the joints and therefore make joint replacement surgery less effective. But none of the research supports that, so it seems that cortisone will not have a negative effect on later surgery," he says. Dr Arroll says it is the first time a review of research into cortisone treatment for osteoarthritis of the knee has been undertaken. He says future research into the area is needed, which would include longer studies that look at the impact of higher doses of cortisone. "How do cortisone injections work? Cortisone is a powerful anti-inflammatory medication that occurs naturally in the body to controls and assists normal body functions. When therapists use cortisone to treat tendonitis, bursitis, and arthritis it acts as a potent local anti-inflammatory drug. Cortisone is useful in suppressing inflammation in the short term, and in the long term, dissolving scar tissue, stabilizing the body's defenses, speeding the healing process, and is very effective in causing certain cysts to disappear.Cortisone is not directly a pain relieving medication, as it only treats the cause or site of inflammation. Your pain is decreased by a cortisone treatment because the inflammation is diminished and this is turn reduces the pain. By injecting the cortisone into a particular area of inflammation, very high concentrations of the medication can be given while keeping potential side-effects to a minimum. What is cortisone?Cortisone is a type of steroid that is produced naturally by a gland in your body called the adrenal gland. Cortisone is released from the adrenal gland when your body is under stress, and natural cortisone is released into the blood stream and is relatively short-acting. The absence of cortisone in the body is called Addison's Disease.Injectible cortisone is synthetically produced but is a close derivative of your body's natural product. The most significant differences are that synthetic cortisone is not injected into the blood stream, but into a particular area of inflammation. Also, the synthetic cortisone is designed to act more potently and for a longer period of time (days instead of minutes). Are there side effects to a cortisone injection?Unfortunately yes. Probably the most common side-effect is a 'cortisone flare,' a condition where the injected cortisone crystalizes and can cause a brief period of pain worse than before the shot. This usually lasts a day or two and is best treated by icing the injected area. Another common side-effect is whitening of the skin where the injection is given. This is only a concern in people with darker skin, and is not harmful, but patients should be aware of this. Other side-effects of cortisone injections, although rare, can be quite serious. The most concerning is infection, especially if the injection is given into a joint. The best prevention is careful injection technique, with sterilization of the skin using iodine and/or alcohol. Also, patients with diabetes may have a transient increase in their blood sugar which they should watch for closely. Because cortisone is a naturally occurring substance, true allergic responses to the injected substance do not occur. However, it is possible to be allergic to other aspects of the injection, most commonly the betadine many physicians use to sterilize the skin." These articles completely underplay the dangers of cortisone injections while overplaying their benefits. While there may be some benefit for advanced cases of osteoarthritis, I do not think there is any place at all for mild cases and definitely not for young people. I am always wary of research that comes out with results that confirm the status quo while going against what I see happening in the field. Please read my earlier articles on this subject. The mechanism of cortisone is not adequately explained in most articles on the topic. 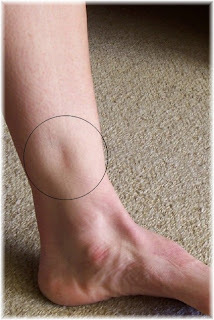 Cortisone is a form of chemical excision and this can be more indiscriminate than a scapel. The side effect of skin blanching (whitening) that is described shows what is happening deep in the area that was injected: the blood flow to the area is shut off, causing tissue death. This is why there is the risk of tendon, ligament or muscle rupture following these injections. That these terrible side effects are not officially reported as often as they are known to happen is par for the course. Adverse medical reactions are seldom recorded with the reported rate being less than 10% by some estimates. Why is there such a paranoia about inflammation? Have you ever wondered why the body in its wisdom invented inflammation? Inflammation is a natural healing process that one is advised not to interfere with, either by drugs or by excessive use of cold. Inflammation happens when the body pumps blood and nutrients to the damaged area and the cells that remove the damage and rebuild healthy tissue proliferate. If we interfere with this natural process, we do so at the cost of proper healing. We end up with weak tissue that will tear with the first application of strain. Such is the consequence of the ignorant application of drugs and other misguided therapies. What these articles fail to tell you is that there are excellent alternatives. But these alternatives are unpopular. Is it because these are non-drugs therapies which take time and for which there is no profitability for the professionals being consulted? The alternatives are remedial exercises, nutrition and deep tissue massage. Done correctly and given time, these encourage natural healing processes, including supporting the natural healing powers of inflammation, rather than suppressing it. If you are considering cortisone injections for a chronic injury and want to better explore the possible alternatives, contact me.